The Code Creator MEAN stack is a production level foundation for any node.js application. 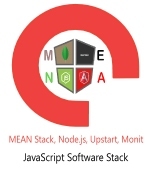 MEAN is a boilerplate that provides a nice starting point for MongoDB, Node.js, Express, and AngularJS based applications. The Code Creator Cloud MEAN stack is a production level foundation for any node.js application. MEAN is a boilerplate that provides a nice starting point for MongoDB, Node.js, Express, and AngularJS based applications. It is designed to give you quick and organized way to start developing of MEAN based web apps with useful modules like mongoose and passport pre-bundled and configured. We mainly try to take care of the connection points between existing popular frameworks and solve common integration problems. The server also contains node.js installed as an upstart job, configured with monit, and as a unix service. This means that your node.js server will stay alive indefinitely and always be restart upon crash on port 80. Having node.js as a unix service means you can easily monitor and start/stop/restart it with the standard linux commands (service node restart), as well as stream and view the log files in real-time. With the Code Creator MEAN stack you will have an enterprise grade, production ready node.js environment pre-configured as soon as your instance boots up.